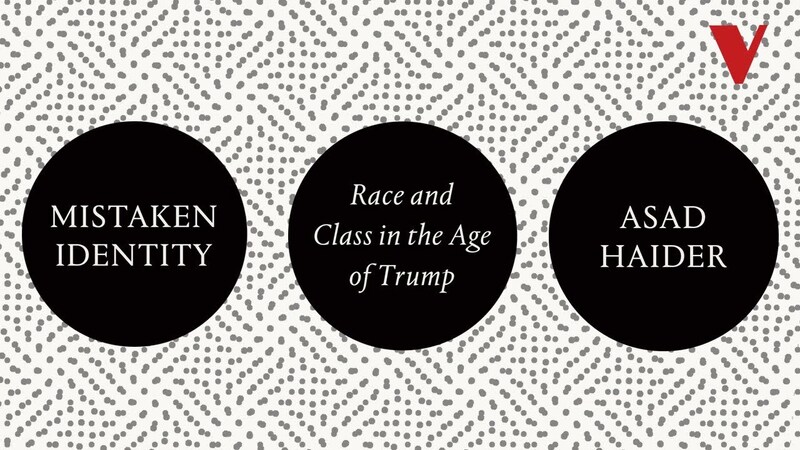 Asad Haider traces the trajectory of “identity politics” and challenges our understanding of the politics of race in this excerpt from Mistaken Identity. Whether class or race is the more important factor in modern politics is a question right at the heart of recent history’s most contentious debates. Among groups who should readily find common ground, there is little agreement. Asad Haider escapes this deadlock by turning to the rich legacies of the black freedom struggle. In Mistaken Identity, he argues that identity politics is not synonymous with anti-racism, but instead marks a retreat from the crucial passage of identity to solidarity, and from individual recognition to the collective struggle against an oppressive social structure. Mistaken Identity is a passionate call for a new practice of politics beyond colorblind chauvinism and “the ideology of race.” It is one of the core texts on our student reading lists and 50% off for the month of September as part of our Back to School sale. See all our Race and Ethnicity reading here. Here we present an excerpt from Chapter 1. But we can’t possibly achieve this if we take these forms of individuality for granted—if we accept them as the starting point of our analysis and our politics. Clearly “identity” is a real phenomenon: it corresponds to the way the state parcels us out into individuals, and the way we form our selfhood in response to a wide range of social relations. But it is nevertheless an abstraction, one that doesn’t tell us about the specific social relations that have constituted it. A materialist mode of investigation has to go from the abstract to the concrete—it has to bring this abstraction back to earth by moving through all the historical specificities and material relations that have put it in our heads. In order to do that, we have to reject “identity” as a foundation for thinking about identity politics. For this reason, I don’t accept the Holy Trinity of “race, gender, and class” as identity categories. This idea of the Holy Spirit of Identity, which takes three consubstantial divine forms, has no place in materialist analysis. Race, gender, and class name entirely different social relations, and they themselves are abstractions that have to be explained in terms of specific material histories. For precisely that reason, this book is entirely focused on race. That is partly because my own personal experience has forced me to think of race beyond the easy theological abstraction of identity. But it is also because the hypotheses presented here are based on research into the history of race, racism, and antiracist movements. Of course, studying any concrete history necessarily requires us to deal with all the relations constitutive of it, and thus we will encounter the effects of gender relations and movements against gender-related oppression. But I make no claim to offer a comprehensive analysis of gender as such; to do so would require a distinct course of research, and to simply treat gender as a subsidiary question to race would be entirely unacceptable. There is already much work along these lines to consider. Butler’s Gender Trouble is itself one of the most prescient and profound critiques of identity politics as it exists within the specific discourse of feminist theory. In Butler’s own words, her critique “brings into question the foundationalist frame in which feminism as an identity politics has been articulated. The internal paradox of this foundationalism is that it presumes, fixes, and constrains the very ‘subjects’ that it hopes to represent and liberate.”9 But here I focus on race, and I will be primarily concerned with the history of black movements, not only because I believe these movements have fundamentally shaped the political parameters of our current historical moment, but because the figures to whom these movements gave rise are at the apex of thinking on the concept of race. There is also the matter of my personal contact with black revolutionary theory, which first exposed me to Malcolm X and Huey Newton’s critiques of the precursors of identity politics. Following their practice, I define identity politics as the neutralization of movements against racial oppression. It is the ideology that emerged to appropriate this emancipatory legacy in service of the advancement of political and economic elites. In order to theorize and criticize it, it is necessary to apply the framework of the black revolutionary struggle, including the Combahee River Collective itself. These movements should not be considered deviations from a universal, but rather the basis for unsettling the category of identity and criticizing the contemporary forms of identity politics—a phenomenon whose specific historical form the black revolutionary struggle could not have predicted or anticipated, but whose precursors it identified and opposed. Mistaken Identity is one of the core texts on our student reading lists and 50% off for the month of September as part of our Back to School sale. See all our Race and Ethnicity reading here.